A rich and fudgy Raw Black Forest Brownie, naturally gluten and dairy free. Cacao, organic tart cherries and vanilla – pretty much the best combo out there. Last weekend I did two cooking demo’s at the Ceres Healthy Hub Kitchen at the Auckland Food Show. What a blast! I did however have a very typical Lauren klutzy moment during one of them, and spilt a whole tin of coconut milk errywhere – thank goodness for my ninja side kick who very stealthily mopped it up while I fumbled around with the can opener! (And for my apron!). Well, we all knew I was a messy cook, so no surprise there, really. 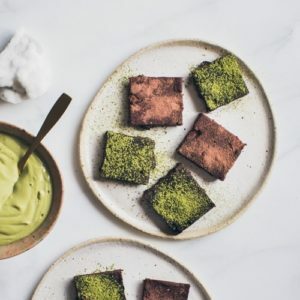 Today’s recipe, as promised, is that luxurious Raw Black Forest Brownie I whipped up, with an antioxidant-packed Matcha Whipped Cream. And, straight out of the gate, I’m going to give you my number one tip for achieving that rich, fudgy texture: take the time to grind your nuts and coconut to a fine meal before starting. Critical, mmkay. If you miss this step, and add the whole nuts straight into the food processor, you will end up with more of a bliss ball than a brownie. 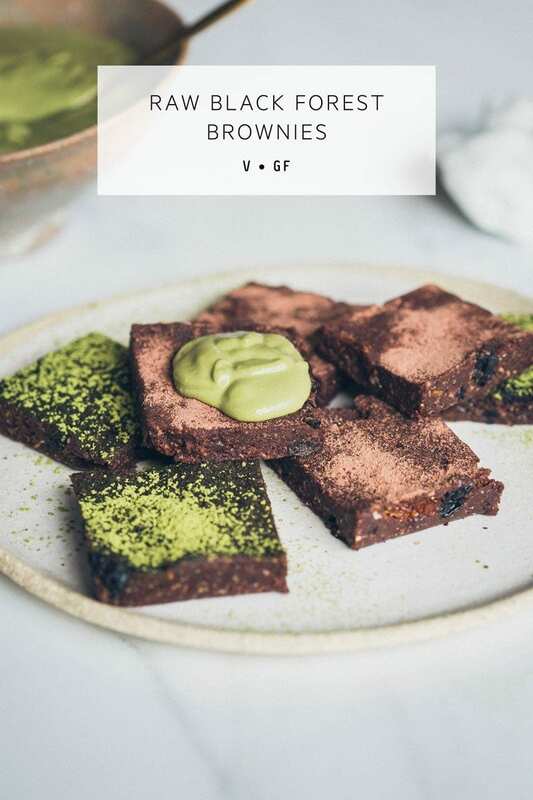 Ok, let’s get into the nitty gritty of the ingredients used (I’m going to focus on cacao – it is the star of the brownie after all!). Raw cacao is superior to cocoa as the antioxidant content is far greater – in fact, as much as 60% of the total flavonoid content of cacao is lost during Dutch processing, which is where they alkalise the cocoa to render it less bitter. The antioxidants in raw cacao (catechins, epicatechins and procyanidins) have anti-inflammatory benefits, and have attracted great interest in their ability to lower risk of cardiovascular disease. Cacao is also a fabulous source of the mineral magnesium. Magnesium has a huge and diverse role in the body – responsible for over 300 biochemical processes. A deficiency in magnesium is associated with an alteration in the hypothalamic-pituitary-adrenal (HPA) axis – this is your main stress response system. A dysregulation in the HPA axis may contribute to enhanced feelings of stress and anxiety. So if you are stressed and reaching for chocolate – it’s perhaps the magnesium your body’s craving! There has been some new literature evaluating cocoa’s potential prebiotic-like effects. Prebiotics are plant fibres that selectively provide a food source for the good bacteria in the colon, thus nurturing their growth, and are an often overlooked yet critical part of a healthy diet. There are now emerging studies to suggest that polyphenols (flavonoids are a class of polyphenols); natural compounds found in plants (particularly fruits, vegetables, cocoa, coffee, tea and wine), are also able to selectively stimulate the growth of beneficial bacteria. One study found that after four weeks of consuming a drink containing high amounts of cocoa flavanols, there was a significant increase in bifidobacterial and lactobacilli populations (beneficial bacteria) and a significant decrease in clostridium (pathogenic bacteria). This suggests these bacterial populations are able to break down cocoa-flavanols and use them as an energy source for growth. These weren’t the only benefits however, as the authors also found a significant reduction in plasma triacylglycerol and a reduction in C-reactive protein (a blood marker for inflammation). 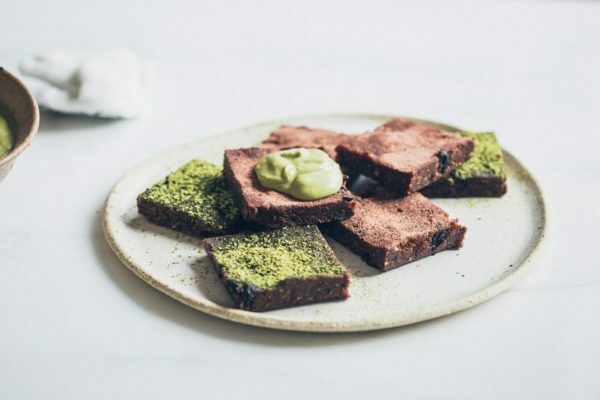 Speaking of polyphenols, tart cherries and matcha are also both excellent sources. What a brilliant combination we have here! Ok, I’m all polyphenol’d out now. I hope you enjoy this recipe, it is rather decadent, so you may find only a small piece satisfies. You’ll make a batch large enough for 16 regular sized squares or 32 smaller portions. A rich and fudgy Raw Black Forest Brownie, naturally gluten and dairy free. Cacao, organic tart cherries and vanilla – pretty much the best combo out there. 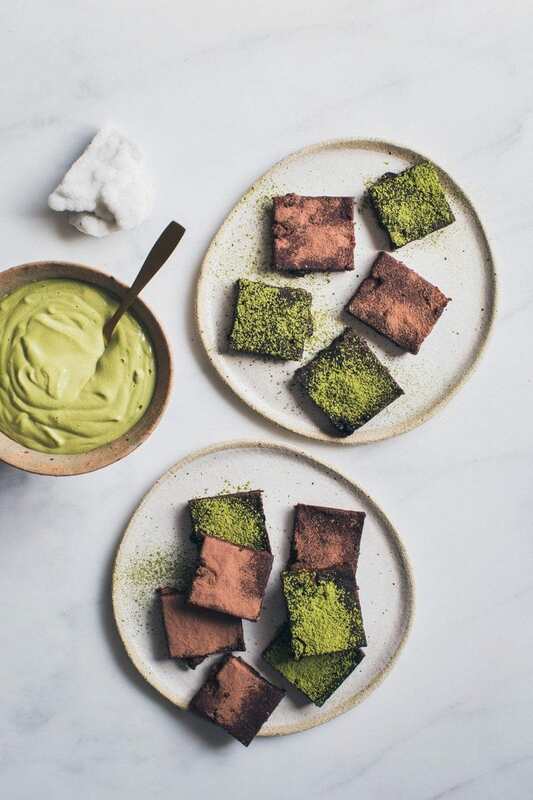 Serve with a tablespoon of matcha cream. Prep: line an 8 inch square cake tin with baking paper and set aside. Soak dates in hot water to soften, then drain and set aside. In a blender, whiz the almond till they become a fine meal. This is the key to a dugy brownie by the way! Add to food processor. Prepare the Brazil nuts and desiccated coconut the same way. Blend all three meals/powders in the food processor to combine. Add raw cacao powder, sea salt and vanilla. Blend again for a few minutes or more. Add cashew butter, blend again to combine, then add dates, one at a time. The mixture should come together like a nice dough. Add the dried fruit, give it a quick blitz to combine, then transfer mixture to the baking tin. Use a spatula to press it evenly into the corners and smooth the surface. Sprinkle desiccated coconut over the top. Set brownie in freezer while you make the cream. Drain the cashews, add all ingredients to the blender, and blend till smooth. Cut brownie in 16-32 slices. 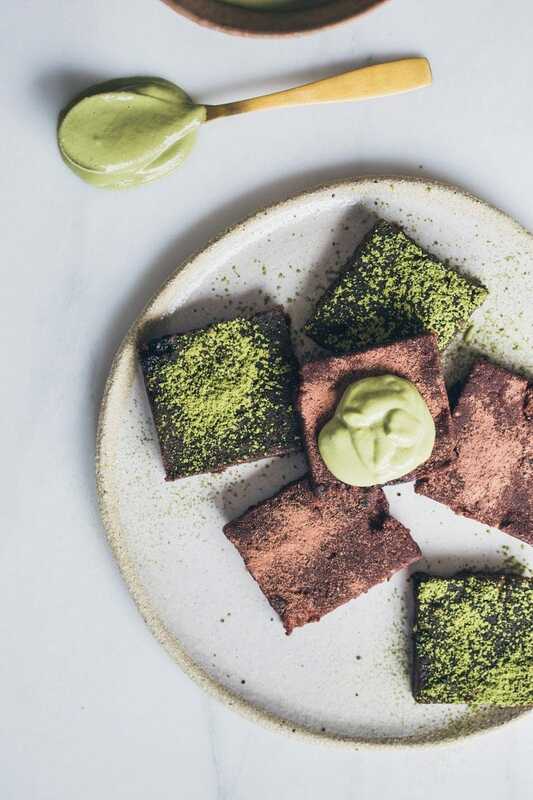 Dust raw cacao powder and matcha powder over the top, serve with a dollop of matcha whipped cream. TZOUNIS, X., RODRIGEUZ-MATEOS, A., VULEVIC, J., GIBSON, G.R., KWIK-URIBE, C., & SPENCER, J.P. (2011). PREBIOTIC EVALUATION OF COCOA-DERIVED FLAVANOLS IN HEALTHY HUMANS BY USING A RANDOMIZED, CONTROLLED, DOUBLE-BLIND, CROSSOVER INTERVENTION STUDY. American Journal of Clinical Nutrition, 93(1), 62-72.